On arrival at the outskirts of Letchworth another rapid change of scene for the HOOP took us off field-edge paths and the dense undergrowth around Wilbury Hill Camp that heralds the walker’s arrival in the town. After crossing the moderately-busy Stotfold Road the route joins up with the longer-established Greenway (what an opportunity missed to call it the LOOP) for the whole of its journey along the eastern side of Hitchin – or to the west of Letchworth, depending on your perspective. With these two towns separated merely by a couple of fields at this point it is an entirely reasonable economy of effort. At this point the Icknield Way is a paved and metalled road leading towards the town centre and the walker will pass the eponymous cemetery, the Wilbury allotment gardens and Fearnhill secondary school before cutting up a side road into Campfield Way and then Highover Road. 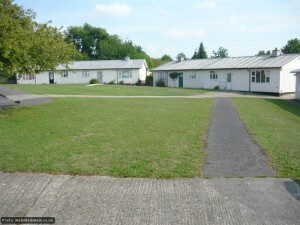 This is an unusual estate comprising 60 carefully-arranged Hawksley BL8 aluminium bungalows that were erected shortly after the second world war to deal with a national housing shortage. Numerous applications have been made to English Heritage to list them in the face of possible redevelopment but they were rejected as the bungalows were considered to be too altered – not least by the addition of replacement uPVC windows. You can read up on the applications here and get a great insight into town planning and development issues in the Garden City. Apart from its obvious historic interest the estate appeared to great advantage at the time of our visit thanks to the fondness of some residents for fine floral displays of summer bedding plants. At the end of Highover Road a mystery was solved for us with the location of the elusive railway crossing over the branch line to Cambridge that leaves the East Coast Mainline at Hitchin, causing a national bottleneck as it does so, one that is going to take tens of million pounds and a slice out of the Burymead Springs nature reserve to unplug. 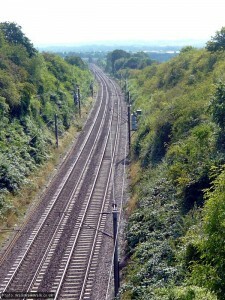 The presence of this branch line means that the walker trying to leave northern Hitchin on foot anywhere east of Ickleford comes up against an impenetrable barrier, not least because walking on the verge of the delimited Stotfold Road is not a safe or a practical option. At least the existence of the Greenway has alleviated this difficulty a bit and it was illuminating to finally find out how. The railway runs in a mighty cutting at this point, so much so that the powers that be have deemed it necessary that the entire footbridge is fenced in with a cage-like thoroughness. On the far side of the railway the route passes through streets with names like Hillbrow and Chiltern View – and it’s easy to see why, the panoramas are stunning. It’s one of those moments when you feel really lucky to live in towns as well-situated as Hitchin or Letchworth. The route here is a little confusing, and needs a sharp lookout mounted for waymarks, but soon the path is back out of suburban streets and on field edges once more, dodging behind a line of garages and a playground to get there. The path runs briefly parallel with the railway and passes an unploughed mound marked on the Ordnance Survey map as as a tumulus which now supports mature trees. Certainly there’s plenty of evidence for prehistoric settlement in this area and the crown has the characteristic dip that would suggest a burial mound robbed out and caved in. 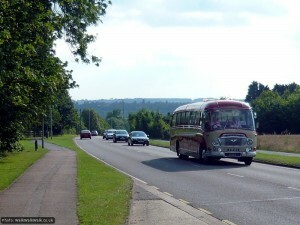 Now on footpaths that were extremely familiar from our extensive roaming around the neighbourhood, we cut through a coppice and then crossed the fields adjacent to Harkness Roses, enjoying mighty views across the town of Hitchin before coming out on the A505 opposite Letchworth Golf Club. If you’re lucky when passing through here you’ll see another of the town’s signature crops, a great drift of roses that rivals the lavender farm for scent and beauty. There are also plenty of the wild variety planted for decoration as well as a small grassy triangle by the road that is left long in summer to form a meadow habitat by this busy road. After crossing with care the walker stays with the Cambridge Road for a short while before ducking into the trees shortly after the Healthy Living Centre. Here a lovely footpath running down the side of the golf course eventually cuts through woods to join up with Kingswood Avenue in Purwell. 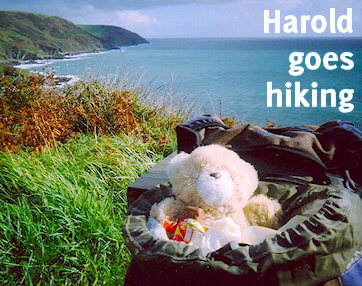 This is a popular spot with dog walkers but not necessarily that widely-known, a deficiency someone has tried to rectify by adding some picnic tables – so a possible place to consume your packed lunch or rest your legs, depending on the point in your walk at which you pass through. Heading north from here the walker will experience rolling fields and open countryside on one side of the road and a pavement and front gardens on the other – truly the very edge of the town. An interesting stage follows as the HOOP cuts unpromisingly up the side of a recycling skip at the point where Kingswood Avenue hangs a sharp right to become Purwell Lane. 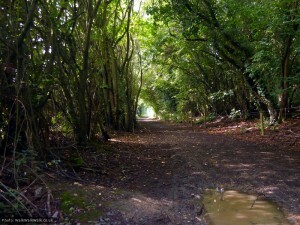 However this shady path, known locally as Gypsy Lane, has plenty of hidden delights with the Purwell Ninesprings nature reserve off to the right and the unploughed site of a large, unexcavated Roman villa a bit beyond it to the left – look for a field-edge path then a large section of wild grass in an otherwise cultivated field. The villa is fascinating and a special interest of council archaeologist Keith Fitzpatrick-Matthews – you can find some notes of his on the subject here (particularly pages 10-15). The nature reserve is a habitat for water voles and is due to have considerable work done on it in the next few years to improve it and create better, managed opportunities for public access to some areas. Leaving Gypsy Lane the walker turns hard right and endures a short section on a fast, unpaved road before emerging past the Ippolytts Brook in a channel between houses, circumnavigating a roundabout and walking along Wymondley Road for a brief spell before cutting back onto footpaths to make a longer and better acquaintance with this little watercourse. 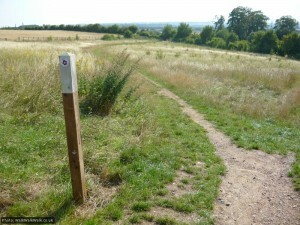 Surreally, the signpost at the end of Gypsy Lane also carries a waymark for the Stevenage Outer Orbital Path, or STOOP, presumably because that’s what you’d be doing if you tried to walk such a wide-ranging route in one go. Either that or the long-threatened Stevenage expansion is bigger than any of us ever imagined.